Mild, tasty white bulbs with dark green stem. 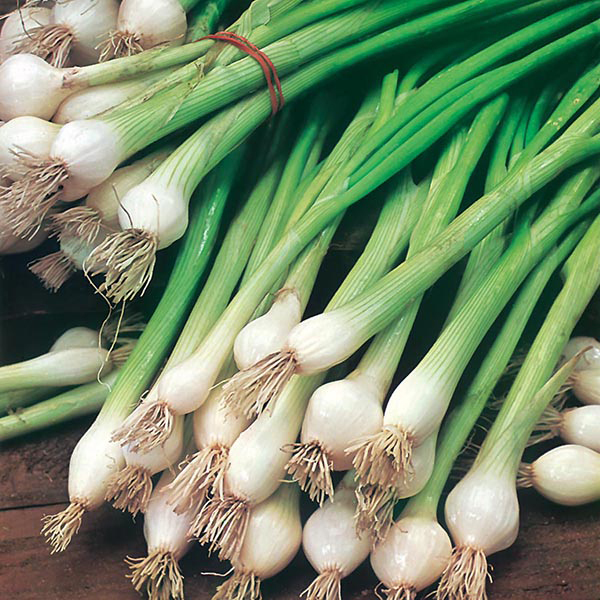 Quick and easy to grow, perfect for salads and stir fries. Outdoors: sow thinly, March-July, where they are to crop, 1.5cm (½") deep, directly into finely-prepared, well-dug, fertile soil, which has already been watered. Allow 15cm (6") between rows. Early sowings may benefit from cloche protection. Seedlings usually appear in 14-21 days. No thinning is required, but keep well watered in dry spells. Regular sowings, made every two to three weeks, will ensure a continuous supply through the summer. Harvest: May-October. Spring onions are ideal for growing in containers or pots of compost, on a patio or balcony where space is limited.